I’m sure I’ve said this before, but, much as I love the saxophone (in all sizes) as a solo instrument, a quartet is more problematic. Unless the composer/arranger, and/or the players, is/are careful, the sound can end up just too homogeneous to be really interesting. 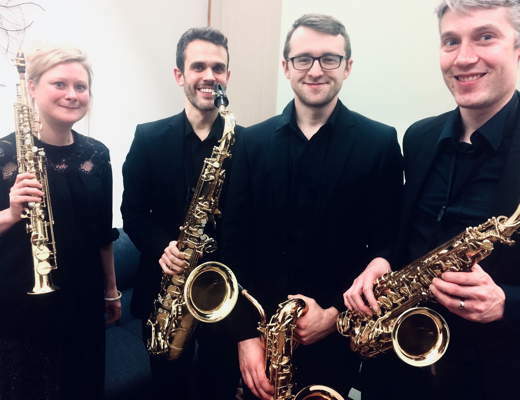 It was an obstacle the Syzygy Quartet’s recital for Derby Chamber Music – Multi-Faith Centre, Derby University, Derby, UK, 18 January 2019 – didn’t always succeed in overcoming. The first half comprised transcriptions of an entertainingly wide variety of pieces, starting with a sprightly version of Rossini’s La Danza, from his vocal collection Les Soirées Musicales. A version of Monti’s Csárdás was effectively moody in the slow sections, nimble in the quicker ones. In J S Bach’s Italian Concerto the distinctions between solo and tutti that would come readily to a player on a two-manual harpsichord were not always clearly distinguished. But there was plenty of forward drive in the first movement, and the long-drawn lines of the sarabande-like second were finely spun. The finale felt just a little rushed, with some details skated over. The remainder of the transcriptions in part one were by the group’s baritone player, Neil McGovern. Mozart's Adagio and Fugue in C minor, K 546, and the Sinfony from Handel’s Messiah made a neat pairing, both of them following the outlines of a baroque French overture. Dynamic contrasts were well realised in both pieces, and some deft tonguing brought clarity to the textures of Mozart’s fugue. Vaughan Williams’ Six Studies in English Folk-Song was the evening’s most successful item, and a reminder that VW himself used a saxophone in his Sixth Symphony, and three in the Ninth. The performance had all the gentle, haunting qualities needed in the slow-to-slowish first five pieces, allied to moments of dark wistfulness, and relished the reel-like dance of No 6. 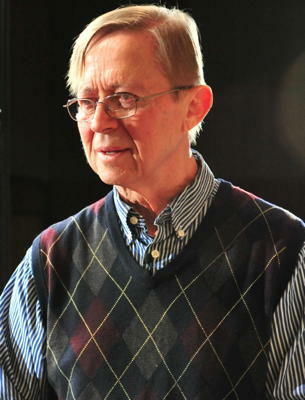 The second half was taken up with one substantial work, an original piece for saxophone quartet, which the Syzygy Quartet had a hand in commissioning, Songs for the Coming Days by American composer Dave Maslanka (1943-2017). It clearly demands intense concentration from the players, who couldn’t be faulted in terms of blend, ensemble, and control of tone. The problem, sad to say, was the piece itself. With nine, mostly slow, movements, together lasting nearly fifty minutes, it is taxing to listen to, built as it is from largely undistinguished material, and often with a lack of rhythmic interest. Any one of the movements individually would have made an effective contrast to quicker components of, say, a three-movement work, or might come into its own as the sound-track to appropriate film footage. But the fanfare-like burst of energy of the eighth movement came too late to redress the balance, and the whole piece was something of an endurance test. Even a re-take of the Rossini, as the encore, did little to raise the spirits.